Last week, I featured a long term chart of the 3 month T-Bill rate along with the Fed rate to show how the former leads the latter. From this I surmised (correctly) that the Fed would cut rates 50 bp to bring them closer to the rate set by the bond market. But the chart was very long term - from the 1940’s onward and so, it tried to cram a lot of info into a small visual space. That made it hard to see what I was trying to get across. Below is a zoomed in chart of the same two variables showing the last 7 years. 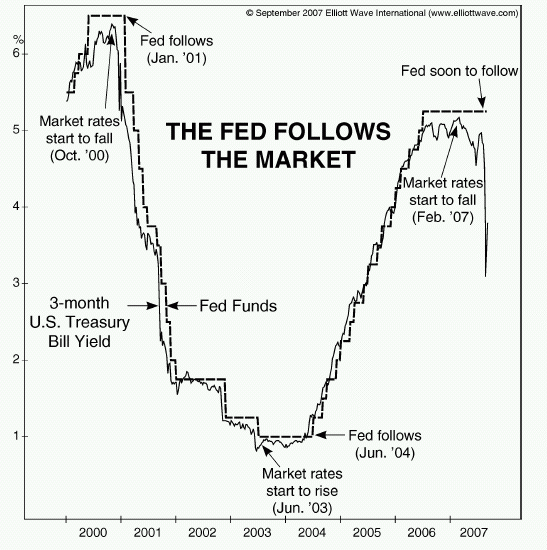 This chart makes it very easy to see that the bond market sets the pace for the Fed interest rate. The graph was in an article written before the Fed announcement at Elliot Wave International. Not surprisingly, the article (link below) comes to an extremely bearish conclusion. Elliot Wave (or as some prefer to call it Idiot Wave) has been extremely bearish for the bull market of the past few years and with each successive rise they have been both wrong and insistent that they will get the crash they’ve been craving for. At this point they remind me of a cantankerous Hillbilly rocking back and forth on his porch, brandishing his rifle at passersby and yelling that the “End of the World is Nigh!”. Does anyone listen to them? If anyone did, they would sell everything, buy gold and escape to live in a shack in the Adirondacks. According to Bloomberg, the top government bond traders who successfully foresaw the last 6 recessions (out of 7) think the Fed will lower the rates again before the year is over. I’m not an economist so I won’t try to come up with data centric reasons. Although I’ve heard the housing and labour market as well as retail sales cited. The reason why I believe the Fed will cut rates is that while they moved quite swiftly to realign the Fed rates with market rates, the gap is still there. Right now the 3 month Treasury Bill rate is 3.67% — more than 100 basis points below the Fed rate. That plus the fact that the T-Bill rate has been persistently and strongly below the Fed rate for more than a year means the Fed is not done by a long shot. It sure seems like the bond market is telling us that the Fed will cut rates again this year. I think it will become more and more important for the equity market to see the economic data in coming weeks and months, as investors will want to see if this is a soft landing or a possible recession. Just one problem. It’s the so called progressives sitting in their university offices that are screaming “the end of the world” from the nonsensical farce known as man made global warming, that are trying their best to scare hillbillies. To bad. The hillbillies have too much common sense for the elite progressives. Aaron, the funny thing with markets is they say the darnedest things. The bond market could just reverse here (although I highly doubt it). yo, I’m not sure what this has to do with global warming but in any case, “common sense” is unfortunately not that common — which is why it is such a highly prized commodity.